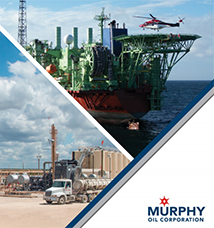 Murphy Oil Corporation is an independent exploration and production company with a strong, oil-weighted portfolio of global offshore and onshore assets with upside to our exploration program. Our global offshore operations are balanced by a predictable North America onshore business. Exploration activities are focused in four main regions: Deepwater Gulf of Mexico, the Atlantic Margin, Southeast Asia and Australia. Sign up to receive e-mail alerts whenever Murphy Oil Corporation posts new information to the site. Just enter your e-mail address and click Submit.